Sponsored by the US Coast Guard, the State of Maine and the American Lighthouse Foundation, Open Lighthouse Day offers the opportunity to view and photograph many of the coast's iconic lights. 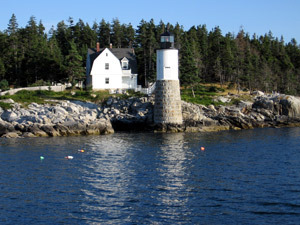 Midcoast Maine is home to many beautiful and historic lighthouses. Isle au Haut Boat Services is offering a two day tour of ten lighthouses for 2019 Lighthouse Weekend. Vistors will ride our fully Coast Guard licensed and inspected 46 foot passenger vessel for Saturday and Sunday cruises lasting between four and five hours. On this September 14 cruise only we've been invited to go ashore for a guided tour of the Isle au Haut lighthouse. Now owned by the Town of Isle au Haut, the normally closed tower will be open for our trip. We're donating $10 of each fare to the Lighthouse Restoration fund. Leaving our Stonington wharf at 11:45 am on Saturday September 14 we'll cruise past the Mark Island Light at the western entrance to Deer Isle Thorofare and then cross the East Penobscot Bay to view the Goose Rocks Light. We'll travel through the Fox Islands Thorofare, passing picturesque North Haven Village, and then pass the Brown's Head Light and its keeper's house. 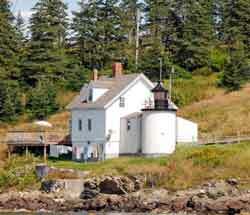 After travelling down the west side of Vinalhaven Island, we'll see the Heron Neck Light. Sailing back across the bay, if weather permits we'll stop for photos at remote Saddleback Ledge, and then return to the Isle au Haut Thorofare to dock at the Isle au Haut Light on Robinson's Point. To make a complete lighthouse weekend, on Sunday, September 15, Isle au Haut Boat Services is offering a special cruise to see four lighthouses east of Stonington. Leaving our wharf at 11:45 am, we'll visit Hockamock Head Light (Swan's Island), Great Duck Island, Bass Harbor Head Light and Blue Hill Bay Lighthouse (also called Eggemoggin Lighthouse). Sorry - we don't go ashore at these Sunday lights. Package Special: September 14 and September 15 cruises, together for $115.00! Advance payment is required to secure reservations; cash, VISA, American Express or Mastercard, refundable for cancellations 7 days or more before cruise date. Call (207) 367-5193. Add viewing of three Pen Bay lighthouses to our regular Seal Island Puffin Tour. We'll stop at remote Saddleback Ledge Light, the Isle au Haut Lighthouse, and Mark Island light. * Please arrive at our Stonington Facility 45 minutes before departure to allow time for parking and boarding. * Routing is weather dependent and at the discretion of the Captain.